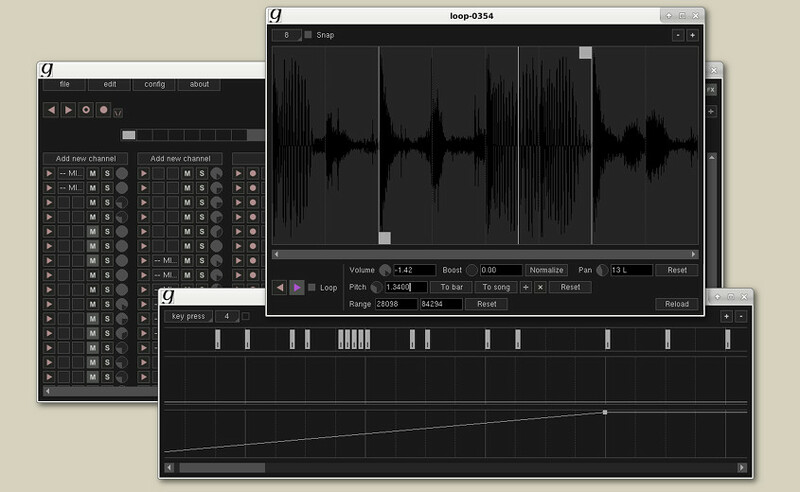 32 bit floating point audio engine, sample-accurate looping system, multithread support, super-sleek interface. 100% exotic dependencies free. Tweak your sounds with the live sampler from external sources, the live quantizer, a built-in wave editor, the action recorder and the action editor. Giada can load VST and VST instruments, as well as read/write MIDI messages from/to any device out there, both hardware and software. 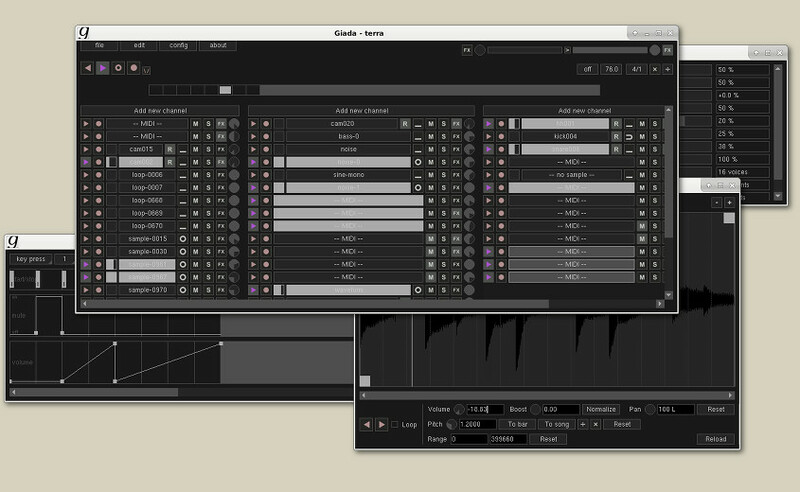 Giada is constantly under development, free for use and distribution: you can use it without any limitations. Help us to improve it more! Latest news from our laboratories. Many minor bugs fixed and a huge code clean-up. Documentation about the new record-on-signal option will be uploaded soon, as well as more video tutorials. Take a look at the full changelog and grab the binaries in the download area! Giada 0.15.3 Medicine Ball released! 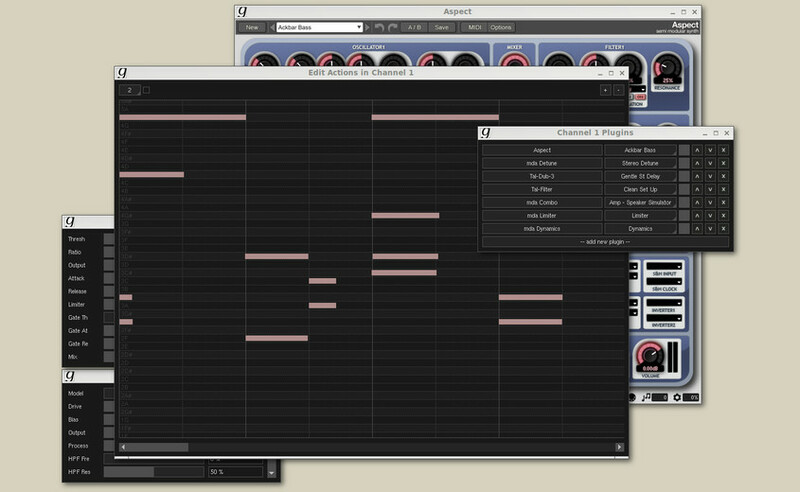 support for 'inaudible' MIDI lightning events, along with optional midimap parameters. Thank you Tomek Szczęsny! lots of minor bugs and crashes fixed. Full changelog and binaries in the download area. Thank you all for you help and support, stay fit! Our buddy Bartholomew Davenport is back with another smashing Giada tutorial! This time he will introduce us to the voodoo universe of the Sample Editor: the tool used to edit audio samples, loops and sound effects. other small improvements and minor fixes. The full changelog is available in the download area. A muscular "thank you" to all the contributors who inspired us with Giada 0.15.2! Yesterday a new version of Giada, 0.15.1 codename Leg Curl appeared in bodily form, inspired by the fitness exercise that involves flexing the lower leg against resistance towards the buttocks. This version mainly features a huge internal refactoring of how Sample Channels and MIDI Channels get processed by the Audio Engine. This renovation opens up the doors to many new exciting functionalities planned for the 0.15 series - take a look here for the full list. In addition to that, we have also fixed a couple of bugs regarding plug-ins crashes on Linux and improved BPM changes detection while running Giada as JACK client. Full changelog + downloads available here. VST Plug-In Technology by Steinberg.